Label Expo ’15 saw us showcase Graphium Label Workflow software for the first time, in a practical demonstration alongside a functioning Graphium press. 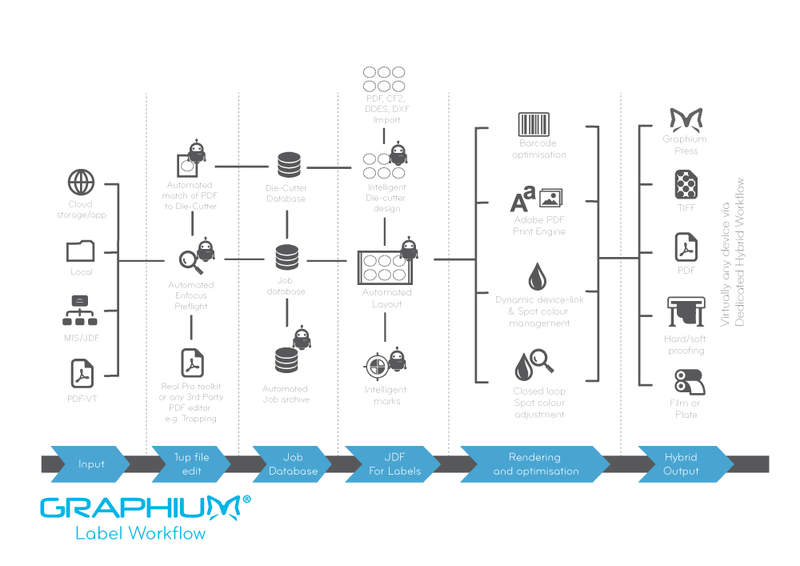 Graphium Label Workflow is based on Adobe® PDF Print Engine and is a scalable, device independent solution that automates label production through a range of intelligent productivity solutions. Developed specifically to facilitate the conversion of high-quality labels across all printing processes. Features include die-line detection, PDF editing (RealPro Toolkit), PDF splitting, automated layout creation, detection of an existing cutter, dynamic marks, spot colour management, barcode processing and much more besides. Graphium Label Workflow’s unique architecture supports a diverse range of printing processes including digital, flexo, litho and screen printing. Or any hybrid combination. Load balance job parts, different graphic types or separations to multiple destinations in parallel. Whilst maintaining consistent colour across devices. Feedback on the workflow following on from the Expo was incredibly positive. Visitors that saw the software demonstration were impressed by the simplicity and level of automation. The majority of alternate systems available typically require far more input than Graphium Label Workflow, which simply requires a PDF file to be uploaded – everything else is automatically produced, and ready to send to the press. This substantially cuts down the time used for pre-press work. Another feature that was well received was the colour management system, in particular, the archiving aspect. You can encapsulate all settings, including all the colour management information, and save this as one job. This gives you the capability to save settings for certain jobs that you can use again in the future, without having to go through the colour matching process again. This again helps streamline the process even further. Feedback on the cutter guides and die cutting process was also very positive. Again people liked the simplicity that this process offered on Graphium Label Workflow compared to the software they were familiar with. Graphium Label Workflow intelligently matches the incoming cutter shape to a layout within its cutter library. If no cutter is found then it will calculate the optimum layout based on available cylinder repeat or sheet sizes.